Although I have tried, the MOBA side of SMITE isn’t quite for me (yet). I’m just not terribly comfortable in the various lane modes like conquest, clash, and joust. But what is awesome about Hi-Rez’s title is that there’s more to do that can entice different types of gamers into the title — even MMOers like myself. I enjoy the arena mode, but I really fell in love with the first PvE challenge Xing Tian’s Mountain, and the subsequent Fafnir’s Wonderland. These special modes offered unique gameplay, which also allowed me to get more comfortable with gods and feel more confident venturing into other modes. So when SMITE adventures were announced at Hi-Rez Expo 2017, I was ecstatic! And I have not been disappointed by any adventure yet. But nothing has been as cool as the newest adventure that opened today, Shadows Over Hercopolis. If you’d thought the past Trials of King Hercules gave SMITE a bit of MMO flavor before, the new Shadows Over Hercopolis does even more so! It’s an action RPG adventure with a number of new mechanics, and it is a blast! I got to play this adventure over the weekend with Hi-Rez’s Isiah Turner, community manager, and Gabe Mughelli, public relations manager. And I can’t wait to dive in again. What is the angle behind this adventure? Loki has ransacked Hercopolis and kidnapped King Hercules. Players have to battle through lands of Norse mythology to try and get him back and restore the town. The journey starts in the icy realm of Niflheim, then moves through the fiery Muspelheim. In hard mode, the adventure continues into Helheim where Loki is keeping Hercules imprisoned. As a story lover, is it awesome to me to see snippets of story get introduced into SMITE. Yes, the gods in the games have real histories, but the MOBA doesn’t have much story as to why the gods are here fighting one another. That’s OK and totally works for a MOBA, but having story behind what’s happening adds an extra depth that I enjoy and gets me more invested in the game. Somewhat disappointingly, the story only sets the stage; there are no bits of story to uncover or discover as you play through other than the mob encounters themselves. But story is story, and I am glad for it starting things off! And I love the chance to explore more of the SMITE world. Like other adventures, players can’t choose to play gods that are elements of the story. This means that Loki and Hercules are definitely locked, but I also found my favorite Izanami was unavailable! Various other gods are also unavailable, although I am unsure as their reasoning. Perhaps they just do not work well in this particular adventure. How this adventure unfolds is awesome. The quests all involve running what amounts to a set of three fairly involved, interconnected MMO dungeons. But that isn’t the cool part: Inside the dungeons are number of new gameplay mechanics. I appreciate how SMITE introduces you to the mechanics early in a less-threatening manner because those mechanics become key to accomplishing goals and advancing. Seeing these for the first time was fun, so if you don’t want to be spoiled so you can discover these for yourself, please skip ahead to the next section, The what. Still here? Well let me share with you a few highlights of my experience with these mechanics. First was listening to Mughelli describe the need to be careful when crossing a bridge right before the wind whipped up and blew him right off! Next was being caught in the middle of his explanation about how to avoid the “upcoming” lava as it was actually bubbling up around our feet and he didn’t notice! The environmental factors were a highlight of this adventure for me. The fact that people have to not only pay attention to the mob itself but to what is going on around added so much more to the experience. They also offer opportunities for some singing: I’ll be belting out Slip Slidin’ Away at many points of this adventure. There are also some puzzles to solve, though they aren’t intense; I only experienced a couple, but I was informed there were more. Again, you have to be mindful of your surroundings. You have to note changes in the environment and react quickly. You have to watch where you step and where you fight, and that makes the whole thing immensely more enjoyable to me. Speaking of fights, the big boss fights are more intense and more involved. I enjoyed seeing how environmental mechanics came into play as I fought the Draugr at the end of Niflheim. I was pretty pleased when we beat him on our second try! And I am really looking forward to reaching and facing the boss at the end of Muspelheim. I am unsure I will have the chance to enter Helheim as this third leg of the journey is only available in hard mode. Can I reach this level of play with two other companions in the six weeks before this adventure ends? I don’t know. But I seriously doubt I will ever make it into the nightmare mode where you can have a final showdown with Loki! Besides looting gear pieces to use during your adventures, players will occasionally loot statue pieces. Those who find them all can restore the statue in the center of Hercopolis and receive a special reward. Although each major section is timed, I’d suggest not speed-running through and ignoring all the chests; these are the only way to add items to your armory to be used during subsequent runs. Did I mention that Loki also stole all your relics from the last adventure? Yup, so you start with an empty bag. When can you get in and play Shadows Over Hercopolis? Right now! The adventure opened today. It will continue for six weeks, and then be sent to the land of ThingsWeWantToReturn. The adventure is free-to-play just as the game is, so anyone can hop in. 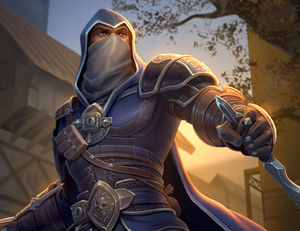 You can also purchase an adventure bundle in the vault for the price of 900 gems. This includes a pretty nifty Loki skin as well as a gold key to unlock other special skins in the gold vault. Will you be giving this adventure a whirl? Feel free to join me in one! I see myself putting as much — if not more — time in than I did during the super-fun Xing Tian’s Mountain Charity Challenge. And if you aren’t sure, get a peek at the gameplay as I dive in on OPTV at 4:00 p.m. EST today.